In the past you had to use "teach cabines", today the whole programming happens at the PC! Once only a digital model of the paint shop has to be established incl. collisions objects, in which robots and conveyor are positioned. After this you can load the CAD data of the work pieces. The programmer need not to stand at the robot and teach each work piece but rather create the programs comfortable offline in his office. These can be transfered via FTP directly to the controller. 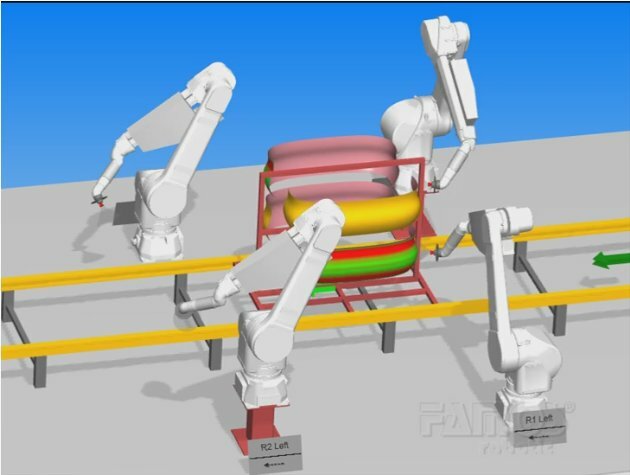 Thus in FAMOS robotic® technology packets are integrated, parameters and signals can be adjusted and set during the simulation. Generated robot programs can be e.g. copied and mirrored and can be used at once at more than one robot. Adjustment of "event axis and -position"